25 years ago on April 24, 1990, Space Shuttle Discovery blasted off the Kennedy Space Center in Florida on mission STS-31 with the Hubble Space Telescope (HST) on board. Fitting with a 2.4-meter or 7.9 feet mirror and instruments observing in the near ultraviolet, visible, and near infrared spectra, the telescope has since recorded some of the most detailed images ever, leading to breakthroughs in astrophysics, such as accurately determining the rate of expansion of the universe. The Eagle Nebula (NGC 6611) is a young open cluster of stars in the constellation Serpens, discovered by Jean-Philippe de Cheseaux between 1745 and 1746. It contains several active star-forming gas and dust regions that became famous when NASA release a HST image "Pillars of Creation" in 1995, capturing three dusty pillars in the Eagle Nebula. HST recently took another photograph at the star-forming pillars with its newest camera, providing much greater details. In celebration of HST’s 25th anniversary, 32 of the best HST images were competing against each other in a series of head-to-head competitions, with popular votes deciding the winner of each round. 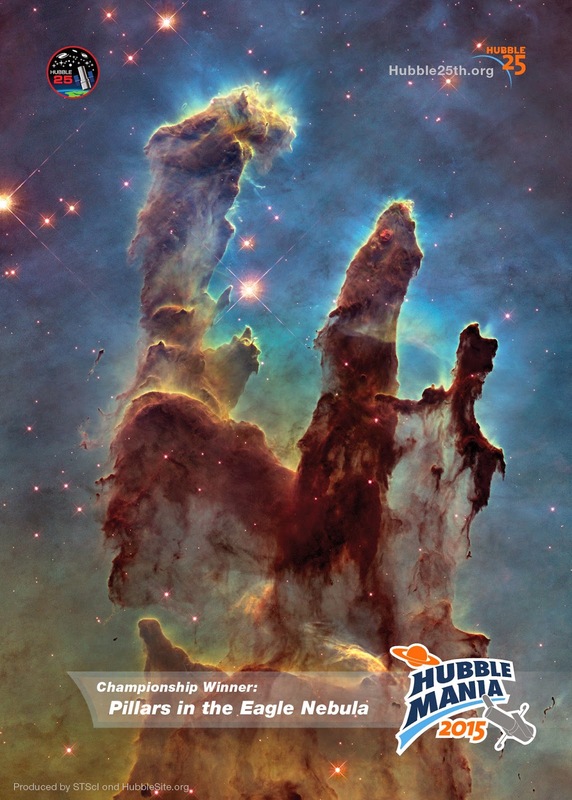 Ultimately, with over 17,000 votes the Eagle Nebula Pillars triumphed over all other competitors to become the winner of Hubble Mania 2015. In this NASA released image that can be made into a 5"x7" postcard under NASA's copyright notice, three pillars of cold hydrogen gas and dust in the Eagle Nebula are shown as the birthplace of new stars, 6,500 light years away. The pillars are bathed in the blistering ultraviolet light from a grouping of young, massive stars located off the top of the image. Streamers of gas can be seen bleeding off the pillars as the intense radiation heats and evaporates it into space. Denser regions of the pillars are shadowing material beneath them from the powerful radiation. I was fortunate for being able to witness the Space Shuttle Discovery's launch for the 3rd Hubble Space Telescope Servicing Mission STS-103 at the Kennedy Space Center in Florida on December 19, 1999.